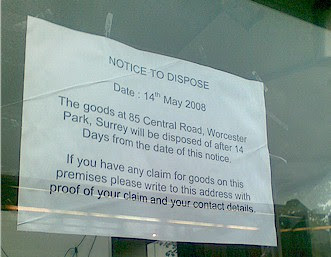 The long-running saga of the 'TV & Video Clinic' is almost at an end - a 'Notice To Dispose' has been posted in the window of the shop, so if you have a claim on any of the TVs lying unloved on the shelves (or fancy blagging your way to that ten-year-old Toshiba telly) then you have until 28th May to make your application in writing to 85 Central Road and lay claim to what is rightfully yours. I'm toying with the idea of writing in and asking if I can have that brick that's in the window. Well, there's nothing else worth having.